Loved your post this week. 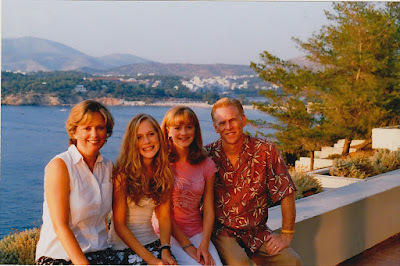 Love the shot of the family in Greece. On my bucket list....but it falls after Alaska and Scotland. I also still feel young - and I guess we should be happy that we still FEEL that way even if the mirror says otherwise. But, hey, I really think we are holding it together pretty good! I think back at my parents at 60ish and back then they dressed old and thought old. I try not to be that way. Lovely photo of your family in Greece. That's great news about the house build! It won't be as long as it has been :) Loved your pictures, too. Thanks for another great 'Hodgepodge'. Joyce... at last - only WEEKS until the house is done. How exciting for you! Again, another group of great Hodgepodge questions. What would I do with out you on Wednesdays! So thrilled that the house project is winding down to weeks. It must really be exciting to see those final details take place and a dream realized. I loved visiting Athens back in the 70's and Granddaughter said their recent trip to the islands was the most amazing experience. I think of Greece as magical - except for the economy. See you next week. True, Mary Lou Retton was awesome! Congratulations on the countdown to the finish line in your home. That is truly exciting. 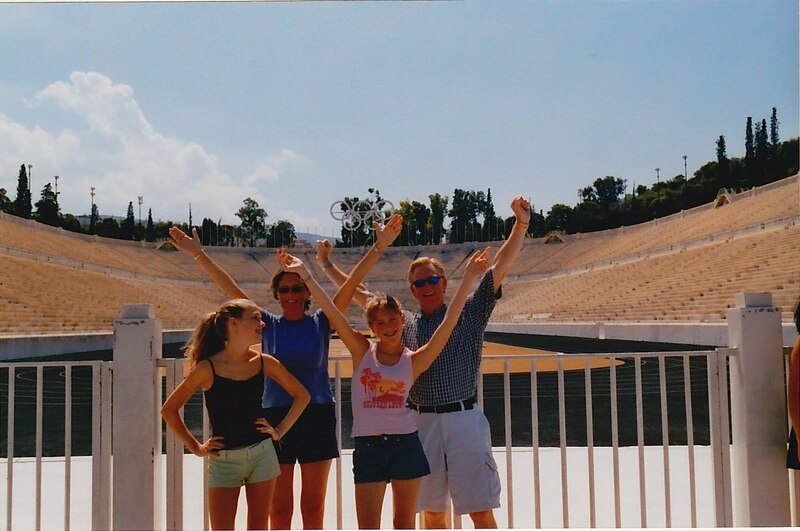 The photos of your family in Greece are great. You all seem to have a wonderful time no matter where you are. I think that also must be a factor in feeling young no matter what our age. I would love to visit Greece. I watch the movie "My Life in Ruins" all the time just for the scenery! Hooray for things moving along with the house!! Can't wait for a virtual tour one of these days soon! I chose Mary Lou Retton too! I enjoy the winter olympics more than summer. Joe doesn't care about them so we don't watch much. I'll insist on the women's gymnastics, though. So glad your on the last leg of the house build. We moved one year ago today. Hard to believe! You have been quite the world traveler for sure! Happy rest of the week! Joining in for my first time. Your trip to Greece looked lovely. Glad the house is on a roll now. I, too, remember Mary Lou Rettin and Nadia Comanich sp.? Thanks for hosting and coming up with the questions! Hope the house gets to completion well! Joyce...I'm with you. Watching Mary Lou Retton was something I won't soon forget. What a little dynamo! Swimming is my fav. event, too! Love watching Michael Phelps! Yay...beyond excited about your house news! I know you're ready to move in and get settled! You are so right about not taking our good health for granted!! I am probably 8-10 years ahead of you on that and can verify that our bodies are getting older even when we feel young in spirit. Loved the pictures taken of your family in Greece! I would love to go to Greece some day. Such a pretty picture in Greece!!! Totally agree with your #5 and like you am shocked to find myself in my 50s, married to an almost 60 year old and talking about RETIREMENT! Don't blink, I'm telling you! Woo Hoo about coming up on a completed house!!! Congratulations on being so close to the house being finished! What an exciting time! Your pictures of Greece are beautiful, it is one of the European countries I haven't visited but wish I had. That's so cool that you have met some of the Olympians, especially Kerri Strug, I just so happened to mention her in my post too! Glad to hear the house is getting down to the wire. Construction projects can certainly give you a headache and I can only imagine how excited you are getting. Thanks for hosting...great questions! How exciting that your house is almost complete! I would be about ready to pop if I were in your shoes. I can't wait until you're able to get moved in and onto this new chapter in your lives. I am glad to hear that you are on the down hill run on the house. Best of luck. The finish line is in sight. There's a recipe for a s'mores casserole type thing on Pinterest. I'd love to say I didn't pin it, but I did. And I'm still planning on making that thing. LOL So glad your move in time is approaching! How wonderful to be spending fall in your home! Great memories in your post this week Joyce. I remember Kerry Strug's final vault on her injured ankle in the 1996 Olympics in Atlanta. She seemed like a nice person in all her interviews. I'm a fan. Thankfully our water problem has been repaired. I concur with your views on showering other places. Enjoy the rest of your week. Thanks for another fine Hodgepodge. Thanks for providing this fun way to get to know other bloggers!